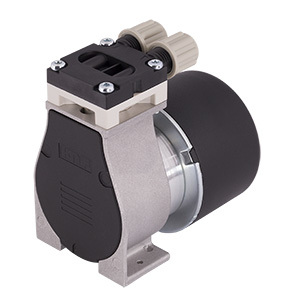 Trenton, NJ, Monday, March 25th, 2019 – The FP 400 is a next-generation diaphragm pump from KNF. It combines the traditional advantages of diaphragm pump technology — self priming, the ability to run dry, and long, maintenance-free lifetime under continuous-operation conditions — with a pulsation level comparable to gear pumps. Pulsation for new FP 400 is less than 150 mbar. Levels far below this are achievable, depending on system tubing hardness, tubing inside diameter, and flow path length/configuration. 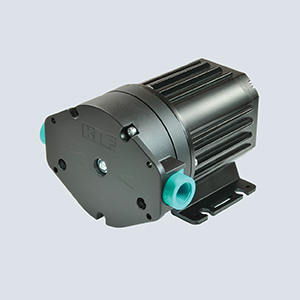 The pump delivers up to 5 L/min of liquid at back pressures to 15 psi, with complete linear control of flow between 10% and 100% of the nominal flow rate. Pump flow is fully stable with fluid viscosities ranging between 1 and 150 cSt. The pump handles viscosities up to 500 cSt with some flow rate reduction. 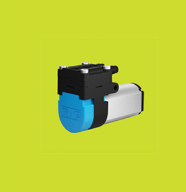 KNF designed the FP 400 specifically to provide gentle, low-shear conveyance of sensitive media. 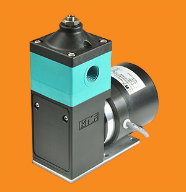 Other strengths of this innovative new pump include very low vibration, a noise level below 55 dBA, chemically resistant flow path material options for use with aggressive media, and an IP65 protection rating. Inkjet Printing: UV, water-based, and solvent ink recirculation to prevent pigment precipitation; ink temperature management; and meniscus control. Glaze, varnish, and hot-melt recirculation. Major global printer and ink manufacturers have already tested the FP 400 intensively for 18 months, raising much interest. Medical Device: Temperature management, including aesthetic laser cooling systems. 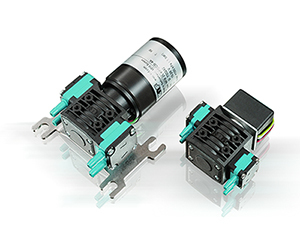 Temperature management/cooling, particularly in systems with sensors sensitive to pulsation. Fuel Cells: Fuel recirculation and membrane hydration. 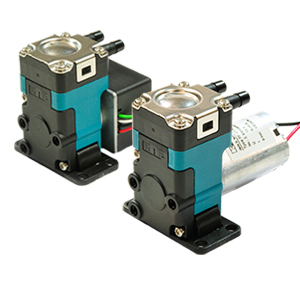 KNF Neuberger, Inc. is a leader in gas and liquid diaphragm pumps and systems for OEM, laboratory and process customers. Typical application tasks include liquid and gas transfer, chamber evacuation, liquid metering/dosing, washing, waste handling, recirculation, aspiration, vacuum roughing/backing, pneumatics, and degassing. Built upon a foundation of engineer-to-engineer collaboration, KNF combines technical expertise and manufacturing leadership to address application-specific challenges for an ever-growing list of markets that includes medical device and diagnostics, environmental/industrial hygiene, laboratory equipment, reprographics, security and defense, semiconductor, energy, various process industries, and more. KNF is committed to serving customers with industry-leading customer service, rigorous product life, and validation testing, and as a reliable and trusted technical resource. We strive to optimize not only our pumps, but also to assist our customers in optimizing their overall systems. In fact, more than 80% of our business involves customer-engineered solutions. For more information, visit www.KNFusa.com. For more information send an inquiry directly to KNF Neuberger Inc. This quick, easy guide presents the case for spec-driven OEM pump modifications designed to meet system — not just pump — performance requirements, based on engineer-to-engineer collaboration. Included is a table of KNF air/gas pumps and liquid pumps, listing their standard specifications. The intention of this book is to provide an overview of the diaphragm pumps with mechanical drive. In addition, examples of applications and advice concerning selection of the right pump are included in the subject matter. The latest KNF micro swing piston gas pump NPK 03 generates high operating pressure with low noise and minimal vibration.